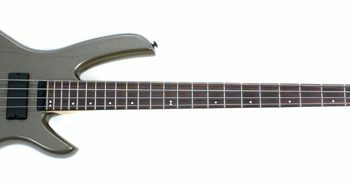 Unlike the common 34” scale length of most bass guitars, the Spector Bantam 4 is a short-scale bass (30”). Characteristically, short-scale basses like a Gibson EB-3 were known to have fewer overtones than a full-sized bass and were a little more “thumpy,” with less punch and a shorter sustain. Forget what you think you know, because none of that applies to the Bantam 4. The Bantam 4 bass is part of Spector’s Euro series and is made in the Czech Republic. It has a chambered body and features EMG humbucking, active pickups and electronics, resulting in great punch without any of the loose, “flappier” attack of other short-scale basses. If you’re looking for that traditional short-scale sound of Paul McCartney, Bill Wyman, or Jack Bruce, you can dial those tones as well. But it goes far beyond those classic tones. There are some great advantages to a short-scale bass if you haven’t played one. 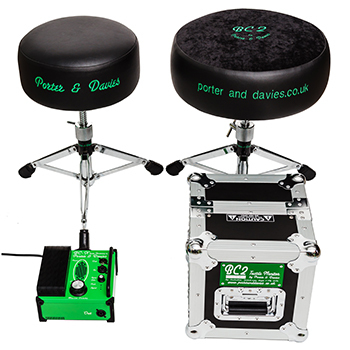 Those of you tired of battling back strain from heavier instruments will love that the smaller instrument is delightfully lighter and compact. It’s especially great for players with smaller hands (or hand ailments), as the shorter scale length makes easier work of dancing across the fretboard (and no, it’s not “kid sized” like the shorter-scale instruments many of us purchase for young children). Really, anyone who loves to play bass but has trouble with the reach on 34” basses will welcome this design difference. And for those of you with lots of fly dates on your calendar, the instrument fits far more easily into the overhead bin and takes up as little room in a small gig bag as a headless bass. As for the rest of it… this is a Spector bass! 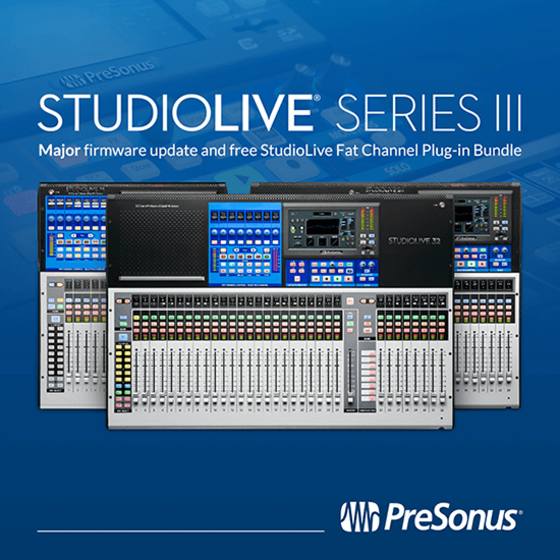 Expect great tone and fantastic playability. Here, the Bantam 4 just happens to deliver that in a more compact package. For the right player, it’s a dream come true. We’ve played some gorgeous Spector Basses in the past, but you don’t notice how special (and more compact) the Bantam 4 bass is until you put it alongside the original NS Spector bass (Yes, we did just that). The body is the same size, but the neck is a fraction thinner at the nut and only has 22 frets. The scale length of the neck is 30” inches, compared to an NS Spector 2 bass with a standard 34-inch scale length. 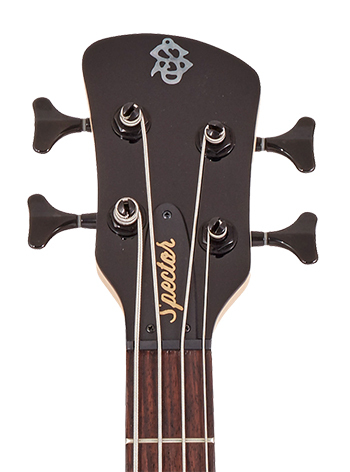 The neck is a bolt-on design with five screws connecting it to the body, which is made of three-piece maple supported internally by graphite rods for additional strength. The neck radius is 16”, and the fingerboard is Indian rosewood, with side dot markers. The European alder wood body is carved in a classic Spector NS style, chambered for lighter weight. 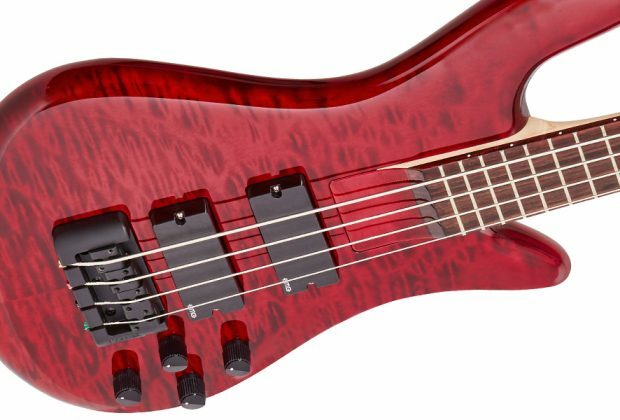 The color of our review bass was a transparent black cherry over a quilted maple top with a high-gloss poly finish. The Bantam 4 weighs in at approximately seven pounds, which is approximately 1.5 pounds lighter than a standard NS. Two dual-coil (humbucking) EMG 35DC Pickups are powered by a EMG BTS Active EQ circuit.Active EMG BT Controls are: neck pickup volume, bridge pickup volume, treble boost/cut, bass boost/cut. The bridge is Spector designed and cast from aluminum, with string spacing at the bridge of .75”, with intonation adjustment screws. The bass comes with a padded gig bag and is strung with D’Addario XL-170 nickel strings. The Spector factory setup was excellent and did not necessitate any adjustments to the bass. The playability of this bass was great, but subtracting four inches from a standard 34”-scale bass impacted how the instrument felt to our fingers—the string tension was a little looser than you’ll feel on a 34” neck. If you pay very close attention, you’ll notice that because of the slightly looser strings, your attack, playing dynamic, and even the sustain from the bass are slightly changed, but we didn’t find this significantly different any more than switching from one of our basses to another. We happily discovered that some of our more challenging finger exercises were a little less daunting to execute on this bass due of its smaller size. Another benefit is that you may be able to play chords and positions on this bass that you just can’t reach on your usual bass. This adds an “X” factor which made this instrument very creative for us. The bass was musically inspiring. The Spector bridge and tuners are standard in design and easy to adjust. Changing strings on this bass is typical. You can put normal length strings on this bass in a pinch, but we recommend you use short-scale strings as they will maintain better intonation across the instrument. The small headstock, light tuners, and short-scale neck helped make the Bantam 4 very easy to play while standing (for hours). There is little “neck dive” and the instrument is very well balanced. Like other Spector models, the bottom strap button is not placed in the center of the body, but up a bit higher. This also helps with “neck dive” and the balance of the instrument when wearing a strap. Our one gripe is a big annoyance: There is no easy-to-access battery compartment on the rear of the Bantam 4 for the active electronics. We had to remove five screws on the back plate in order to access and replace the battery, which could prove extremely inconvenient if the battery died at a gig. We tested the bass in the recording studio, playing through a Tech 21 Sans Amp Q-Strip and a beautiful sounding Avalon D.I. The amps we used in the live room were a Markbass Little Mark 800 into a Markbass Standard 102HF 2x10 cabinet and a Mesa/Boogie Carbine stack (4x10 and 2x12). Also used were two combos: a Dave Eden 2x10 and a Fender Rumble 500. We played the bass in different live settings and used an array of different effect pedals to color the tone. As always, the bass amps were set up at a flat setting with minor EQ changes for the various different room sizes. The results were fantastic. Both the neck and bridge EMG pickups were precise and clean. We liked that they had a round, smooth, deep sound, but we also could dial in a bright and clear tone. The EMG active electronics (two volume controls and two tone controls) enabled us to dial everything from vintage jazz to modern tones. Make no mistake, the short neck and chambered body also affect the sonic characteristics of this bass, and even when it wasn’t plugged in, we could hear subtle differences compared to our unplugged, 34”-scale NS Spector. We were able to get good low-end rumbling, tight punchy licks, and the Bantam 4 also delivered a great slap sound. Independent pickup volume controls are a bass player’s favorite because they work well individually or in combination, giving the player countless different tone options. There was no printed documentation with our instrument, but the Spector website has useful support information concerning care, setup, maintenance, etc. for the Bantam and all Spector basses. Spector basses include a limited lifetime warranty to the original purchaser. The Spector Bantam 4 (MSRP $2,349.99) sells for approximately$1,799.99 including a padded gig bag. This is a good price for a beautiful, European made, pro-level bass.